Designed to provide intuitive, fast response rates, ready-to-use templates and libraries, multiple language support and more. The PP882 and PP885 are designed as a cost-effective, safe and efficient way of monitoring and controlling complex HMI applications. 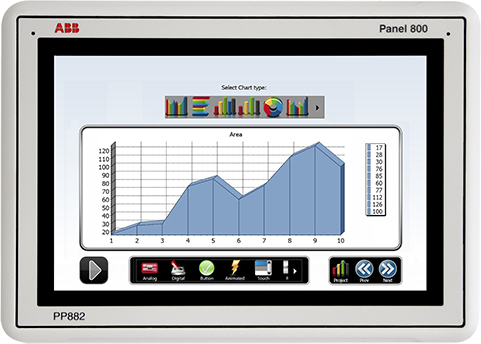 The high performance panels provides improved process visibility through high-resolution widescreen in 12.1” and 15.4”, 262,000 color TFT/LED display with quicker access to multiple applications and an easy-to-use and navigate touchscreen interface. Panel 800 is constructed in a strong yet lightweight diecast, powder-coated aluminum housing. IP65/IP20 front casing withstands wet, dusty and demanding environments. Operating temperatures ranging between -10° C to +50° C with maximum 85% humidity.